By far one of the most compelling artists works I saw in Montreal were the sound sculptures of Charles Stankievech at Galerie Donald Browne. Horror Vacui counterpoints the transparency of sight with the density of sound. 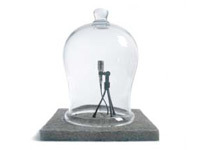 Using Alvin Lucier’s compositional technique of reiterative recording, turn-of-the-century vacuum bell jars become the instruments to create micro-soundscapes. The lyrics of the Velvet Underground, in the bell jars haunting whisper “If you close the door, the night could last forever. Leave the sunshine out, and say hello to never”.